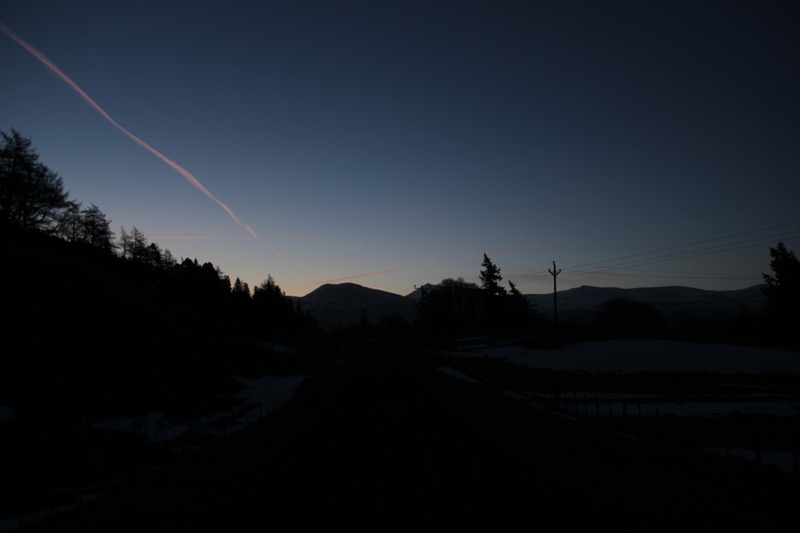 I set off from home nice and early this morning arriving at the walker’s car park at Keiloch by 5:45. 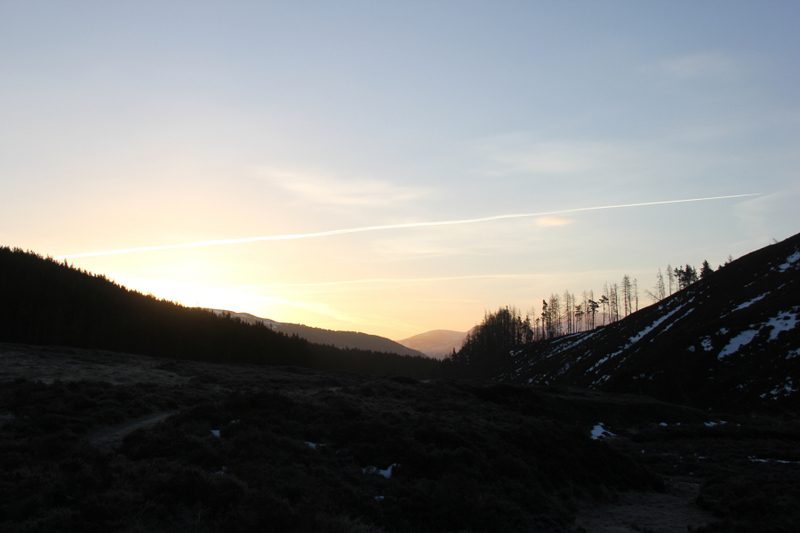 After paying the £2.50 car park charge, and getting suited and booted, I set off along the tarmac road towards Invercauld House with the intention of ascending Ben Avon via Creag an Dail Mhor and Carn Eas. 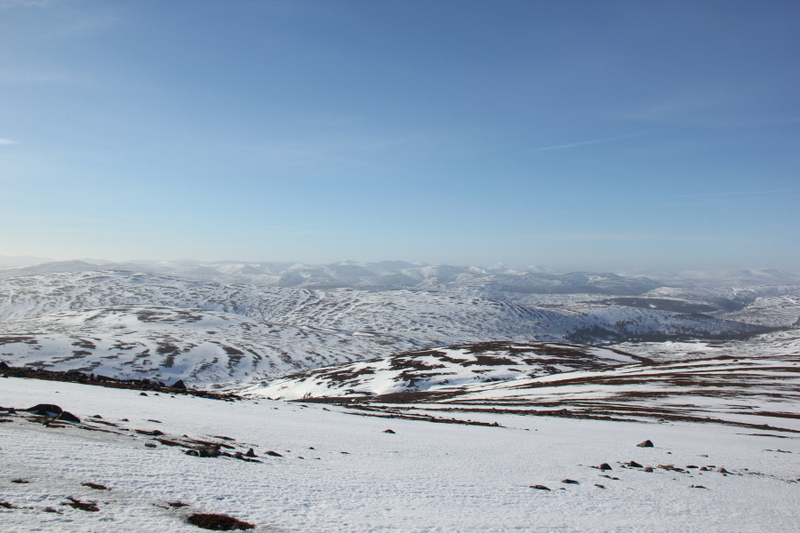 Creag an Dail Mhor and Carn Eas are both currently Munro Tops of Ben Avon. 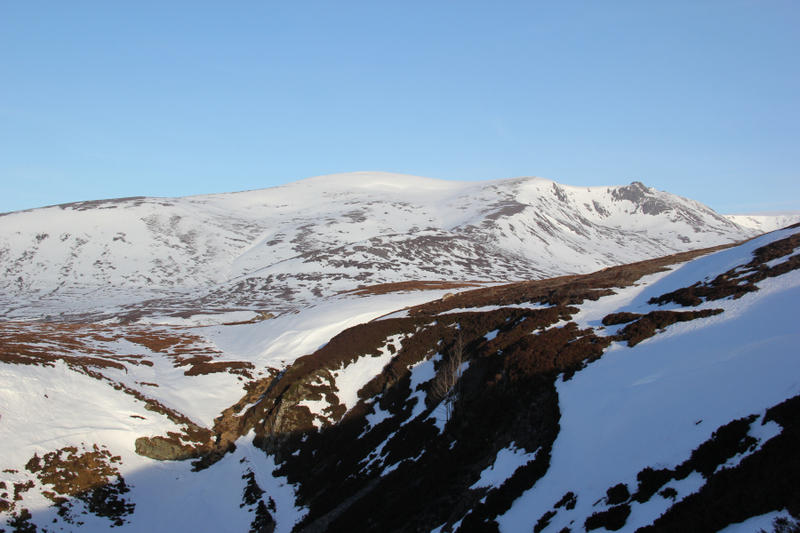 Both of these hills were Munros in the original 1891 list. 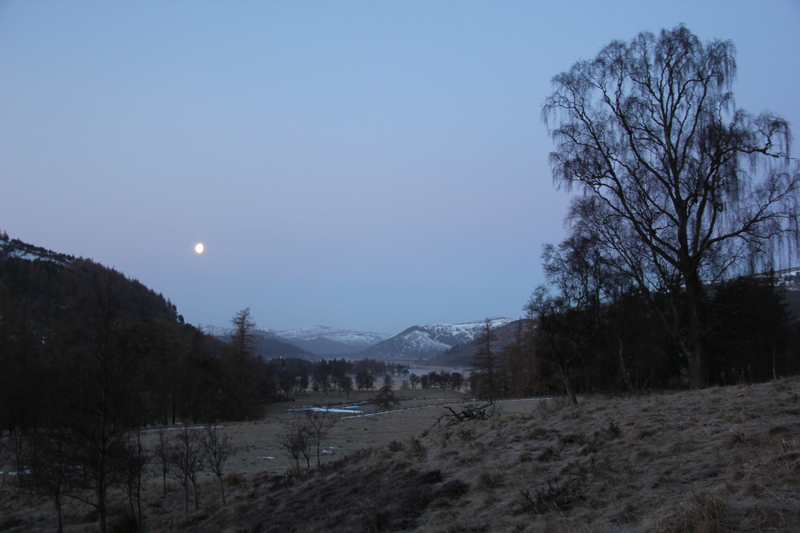 I didn’t need my headtorch this morning as the moonlight was sufficient to see where I was going. 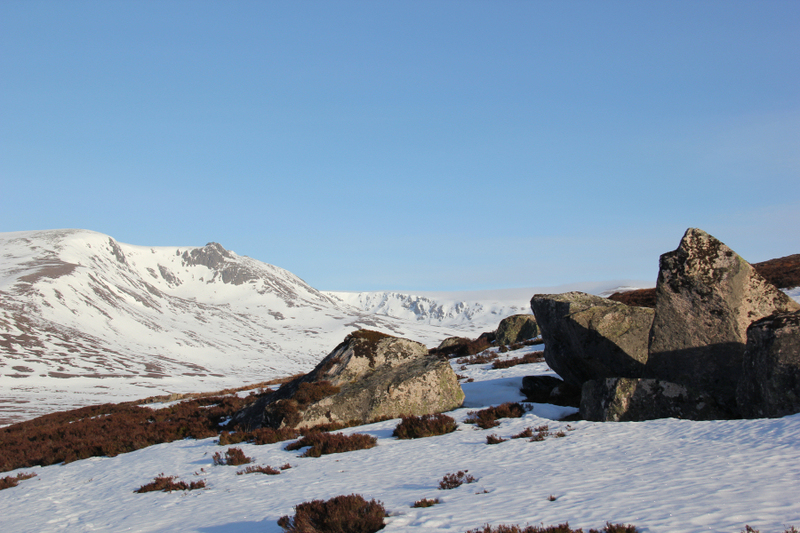 My one and only previous ascent of Ben Avon was back in 1997. 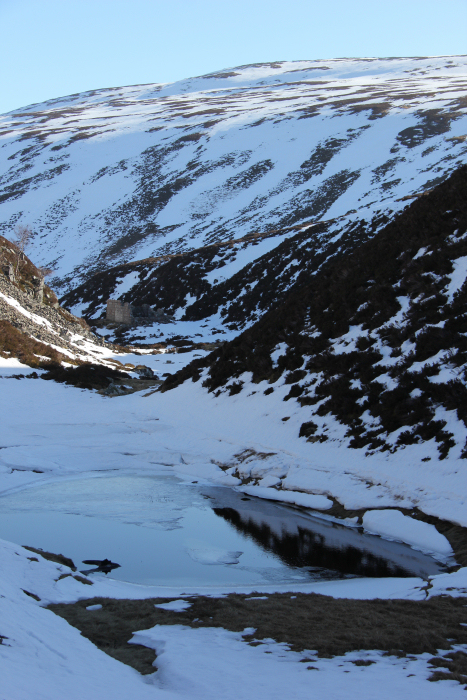 During that ascent the one thing that stood out in my mind was falling in the burn on the way back from neighbouring Beinn a’Bhuird. The early morning colours today were lovely. There wasn’t a cloud in the sky . 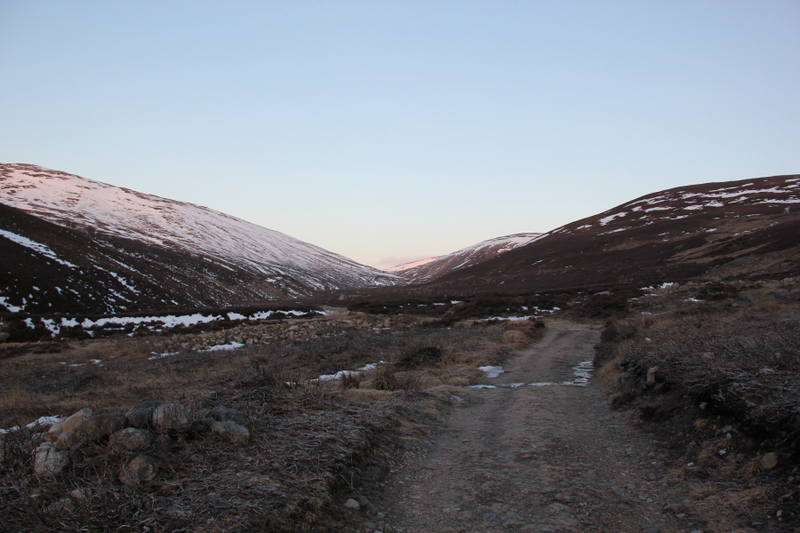 After passing Invercauld House and Altdourie, I set off along Gleann an t-Slugain. 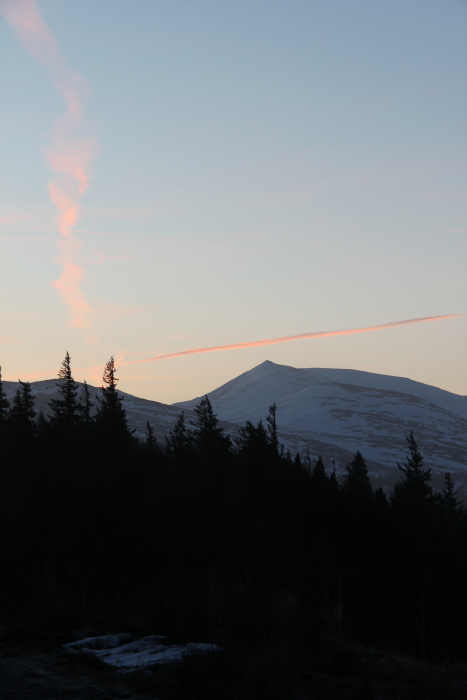 I took a good number of photographs of Beinn a’Bhuird today. It is an impressive mountain. 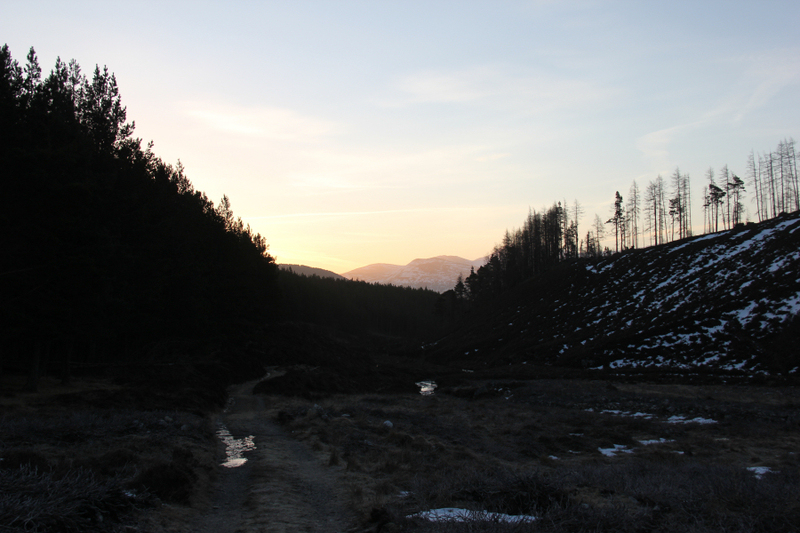 Circa 1km before reaching the ruin, I opted to take the upper path which bypasses the ruin. 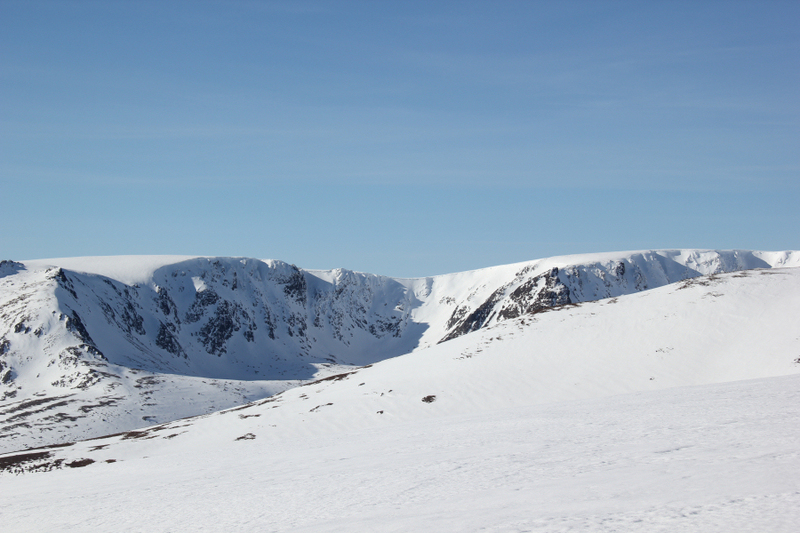 After spending the last two weekends in almost snow-free North-West highlands, I was surprised today to find the snow in the Cairngorms down to such a low level. 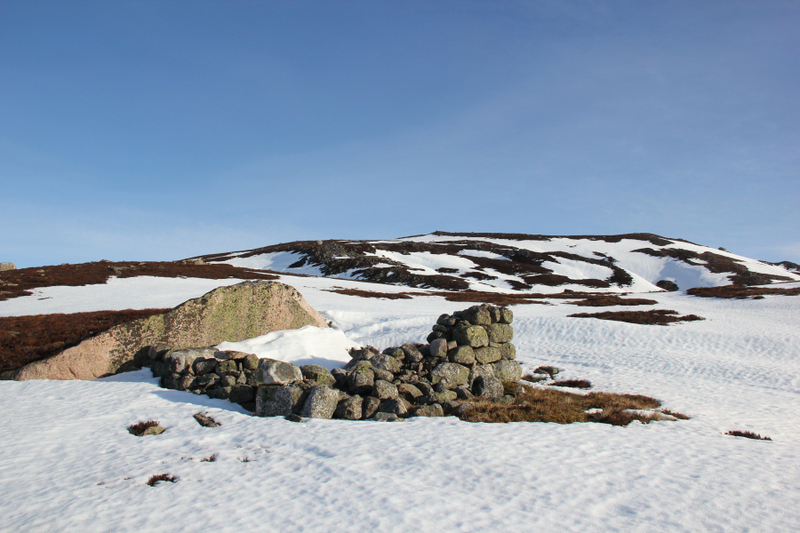 Circa 1km beyond the ruin, I left the main track to ascend Creag an Dail Mhor via Carn Eag Dhubh. 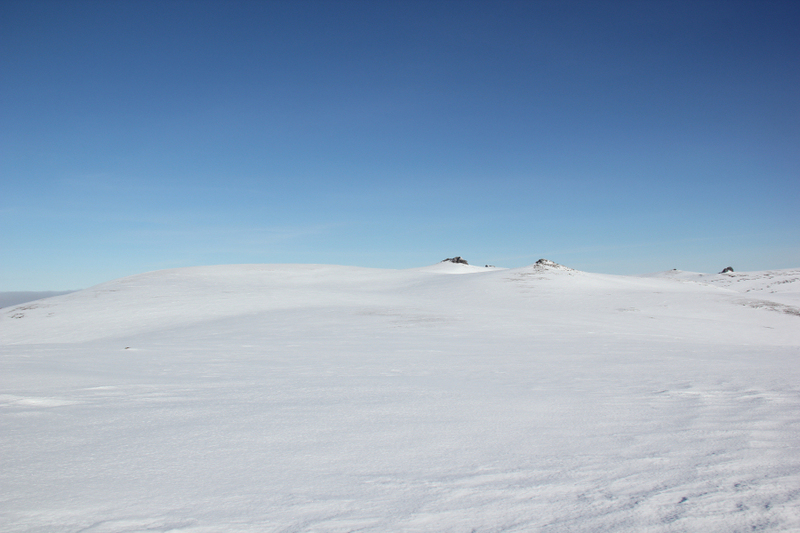 The snow was mostly soft so no need for crampons. 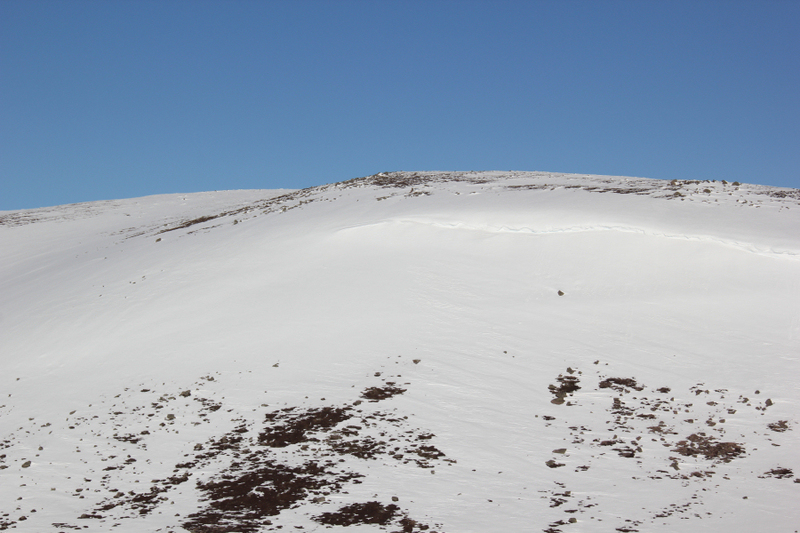 As I made my way up Creag an Dail Mhor, I could see two large cornices and avalanche debris on Carn Eas. 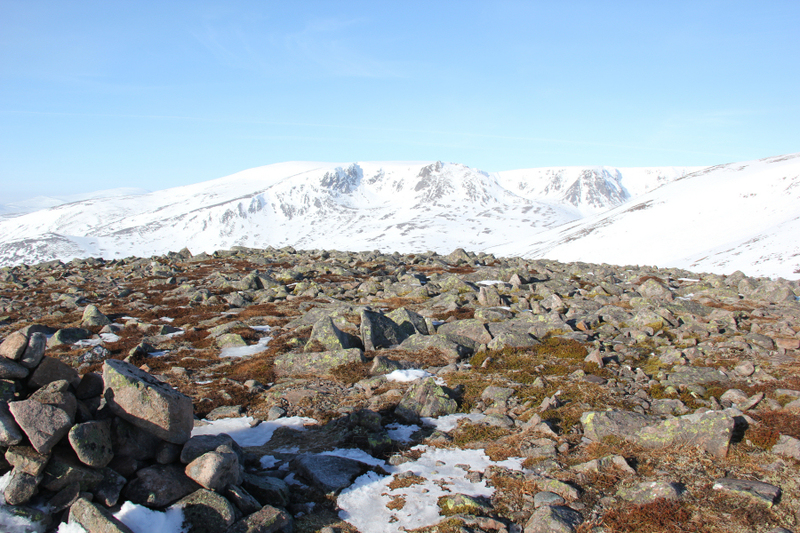 After a couple of minutes break at the summit of Creag an Dail Mhor, I made my way towards Carn Eas. 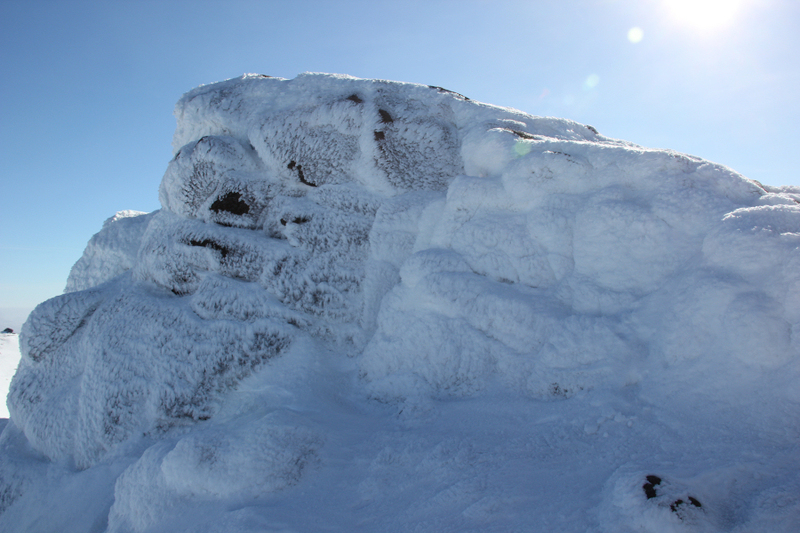 I avoided the cornice in the next photo by ascending to the left of it. The ascent was steeper than it looks in the photo. 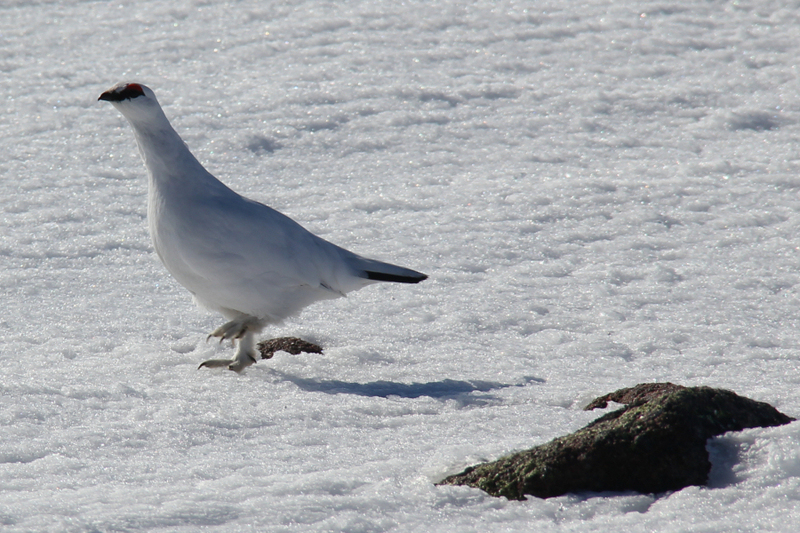 During the ascent of Carn Eas, I stopped to take a photo of a ptarmigan. This was the first of at least a dozen seen today. 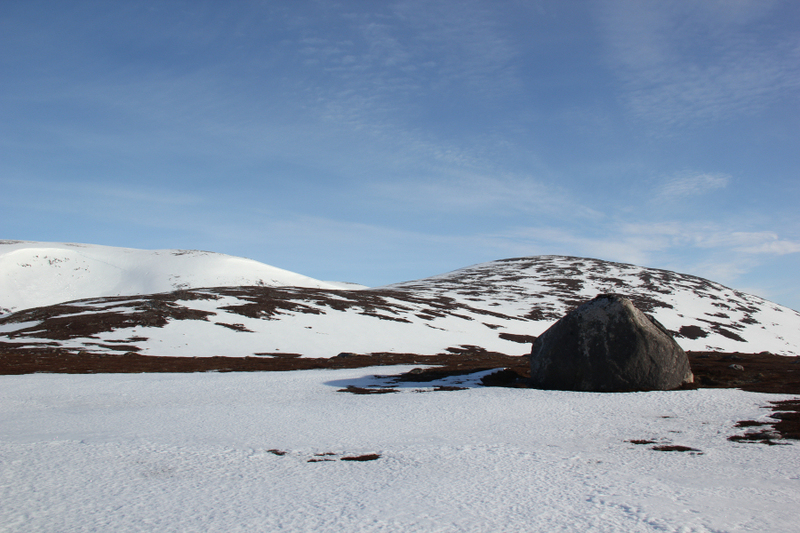 I also saw lots of red grouse, a black grouse and a mountain hare. 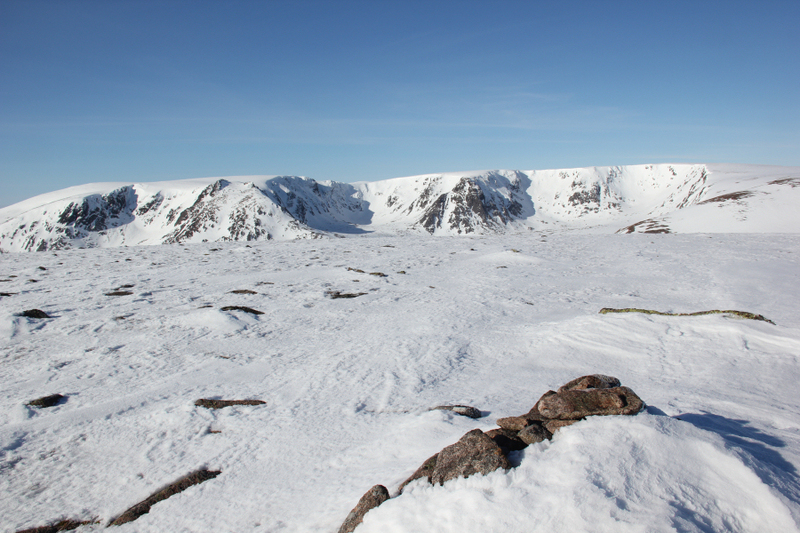 The circa three kilometres from Carn Eas to Ben Avon involved crossing a lot of snow. My legs were already feeling tired thanks to wearing my heavy Sportivas. 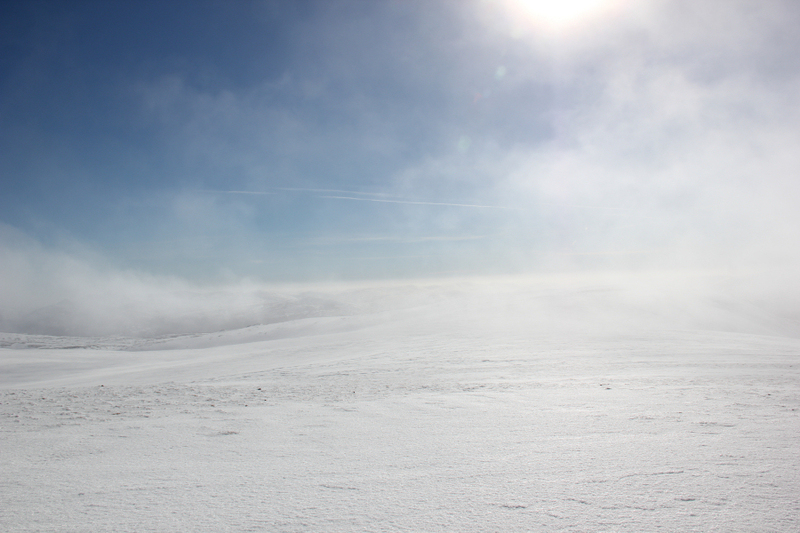 By the time I crossed all the snow, there and back, I was pretty-much exhausted. 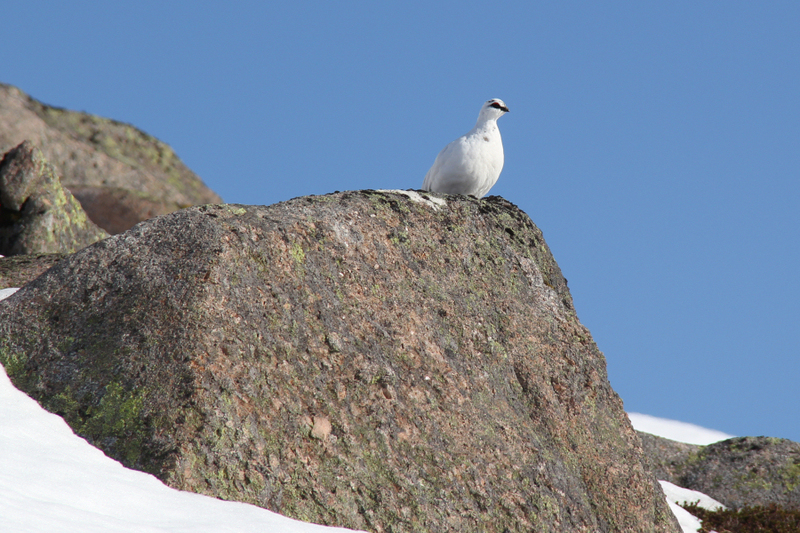 During the ascent of the SW top of Ben Avon, I again stopped to photograph a ptarmigan. I always enjoy watching these birds on the hill. 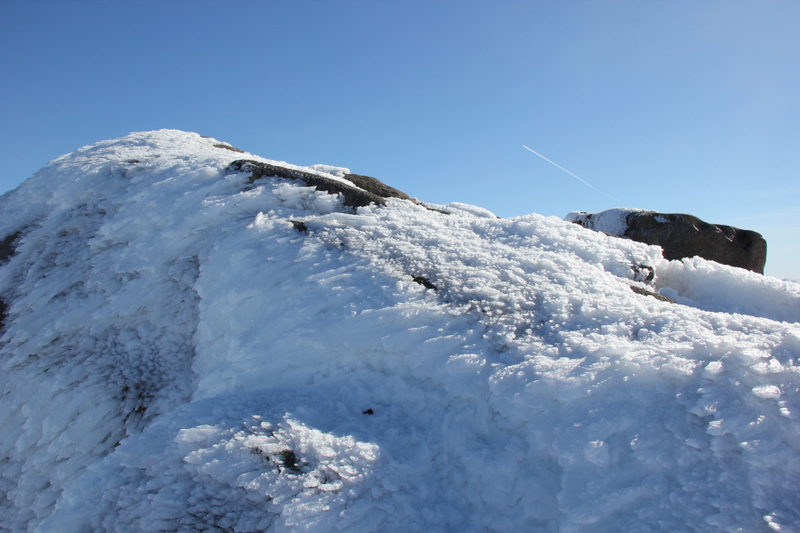 On reaching the summit tor, I carefully made my way up the icy granite to the top. 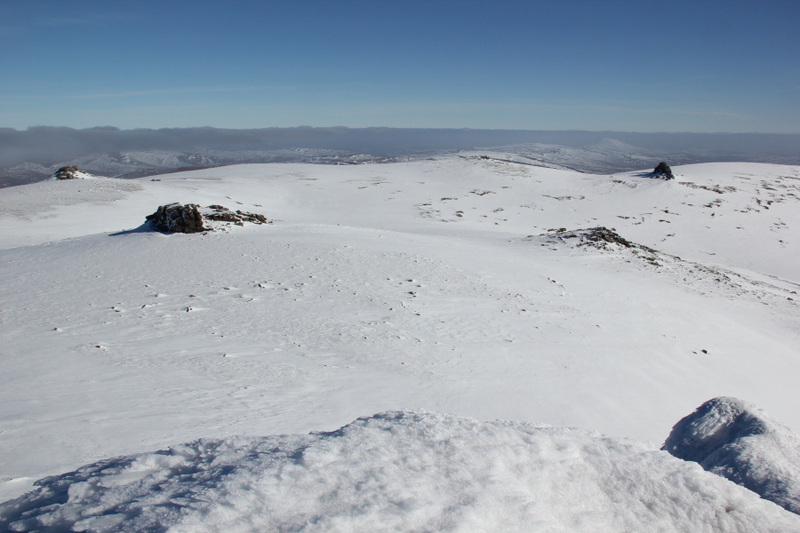 There is no way I would have went up there without ice axe and crampons. After taking a couple of photos at the summit, I made my way back down to safety and had my first bite to eat of the day. During the walk back, I had to walk through mist for circa 30 minutes. 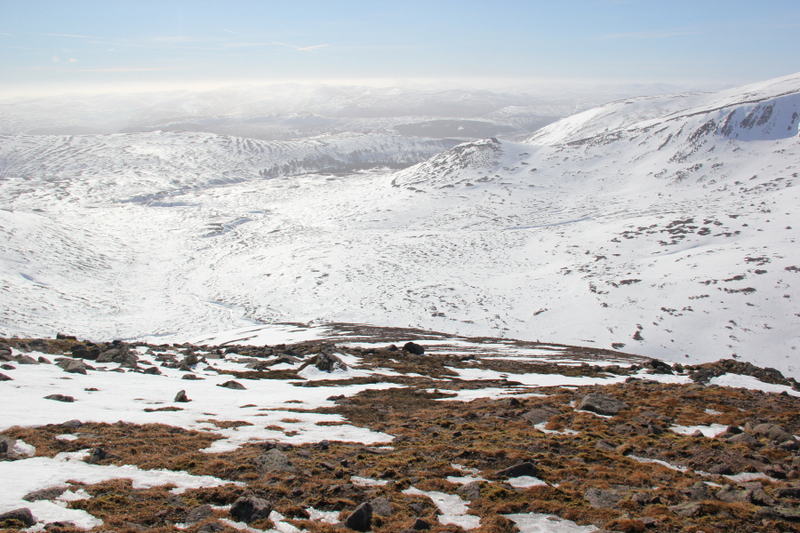 I decided to return to Carn Eas and then have a look at the South-West shoulder as a possible descent route. 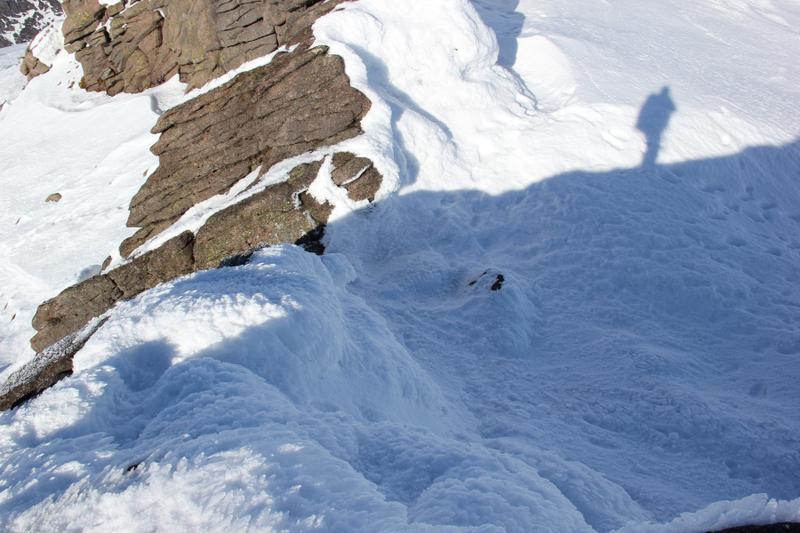 I prefer sticking to ridges and avoiding coires in Winter. 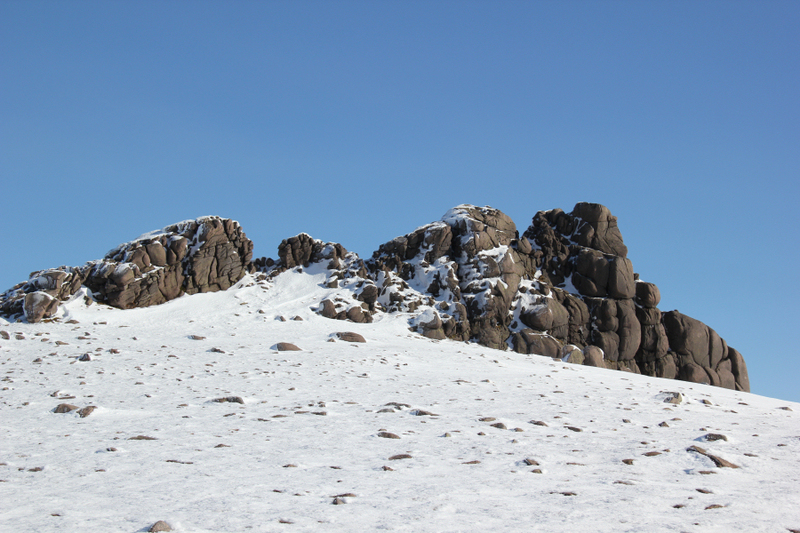 The South-West shoulder of Carn Eas turned out to be an excellent descent route. 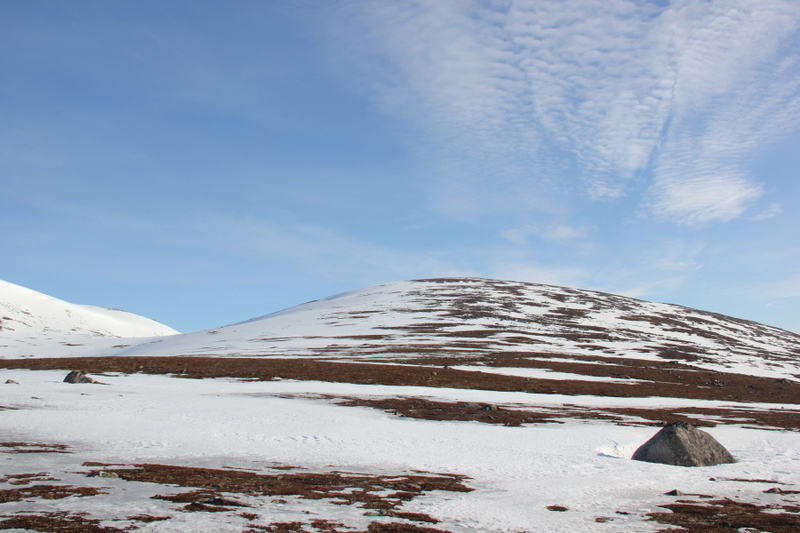 During the walk out, I met two climbers heading for Beinn a’Bhuird with the intention of camping there tonight and climbing tomorrow. Their packs looked seriously heavy. The walk out was hard work. 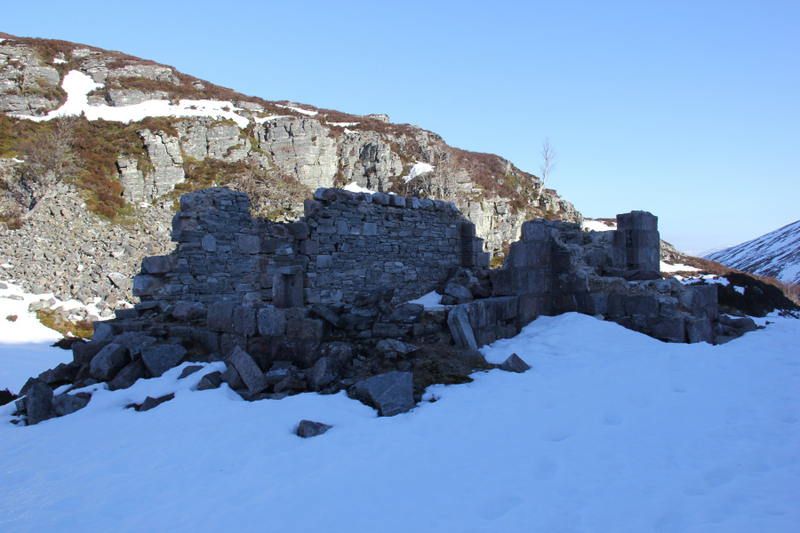 On the way out, I took the lower path past the Gleann an t-Slugain ruin. I then returned to Keiloch via my in-bound route. 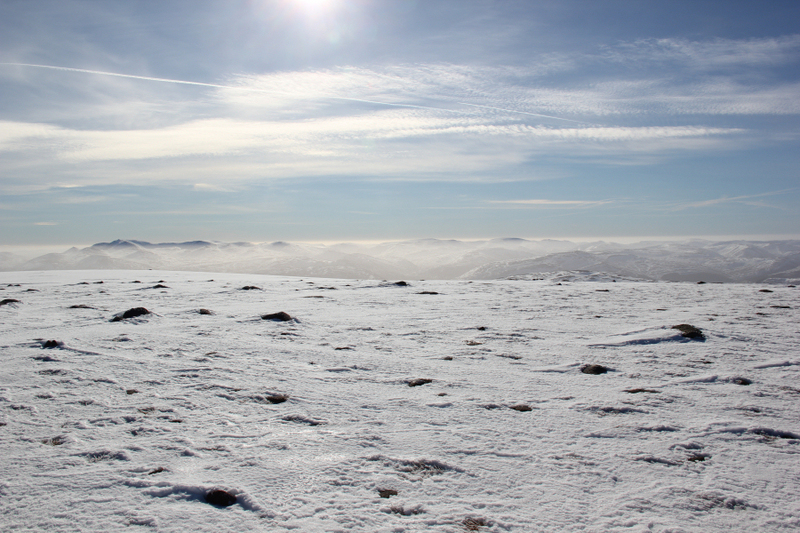 Nice to venture into these hills in Winter . Nice one Foggie, especially like the route. Long way on that snow - what condition was the snow in? 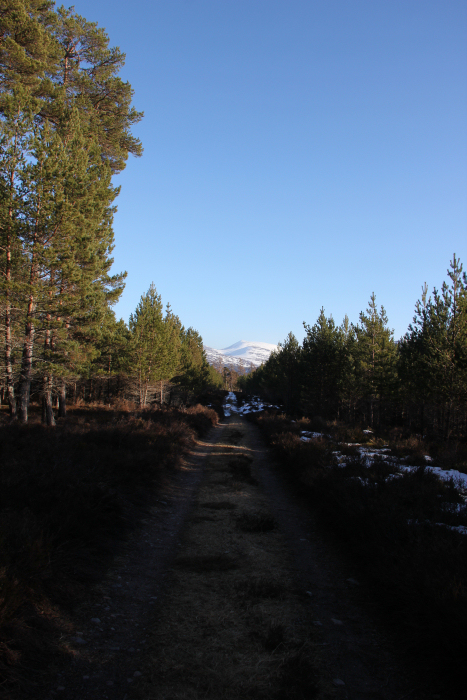 Creag an Dail Mhor is on my radar as its a Murdo - and I may as well do the other Top to complete my set for this sprawling hill having bagged the NE ones last summer when I approached from Glen Avon. 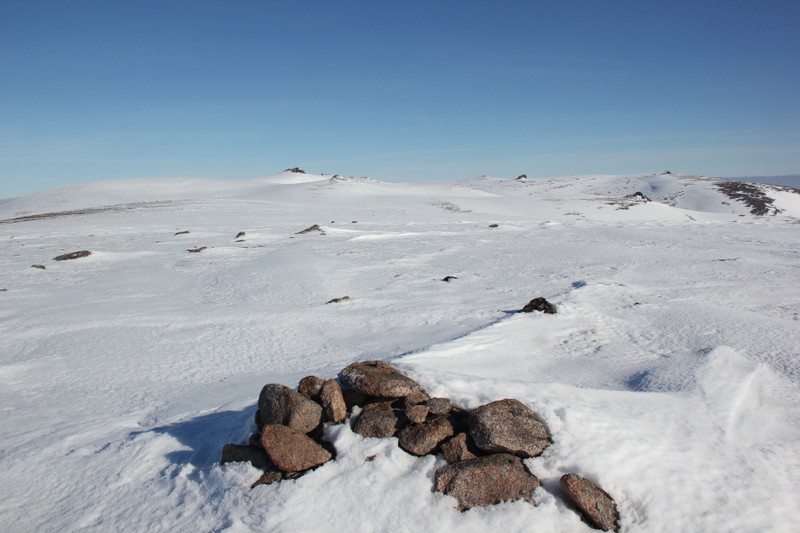 It certainly looked as though it was hard work and a long way on the snow and ice. Alastair S wrote: Nice one Foggie, especially like the route. 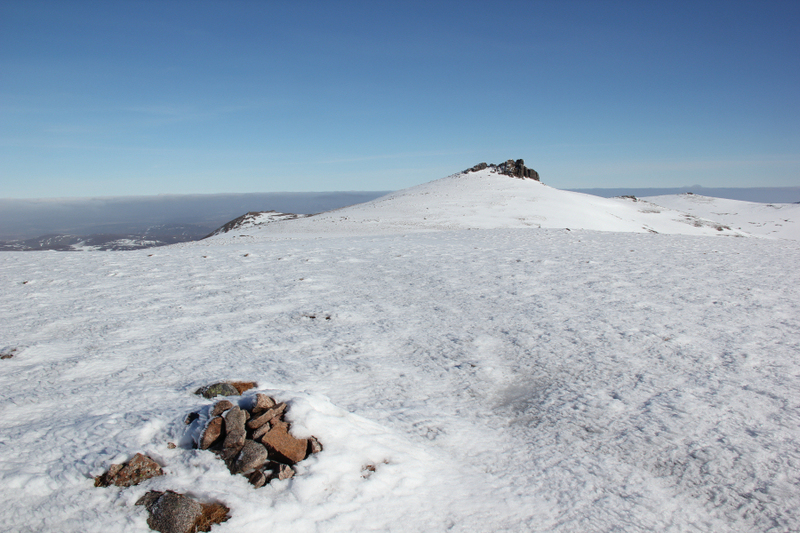 Long way on that snow - what condition was the snow in? 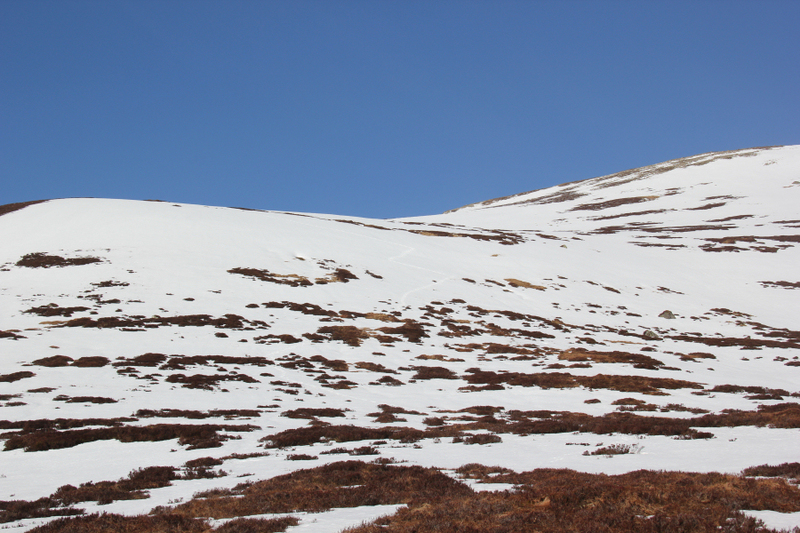 In the lower parts the snow was fairly soft. 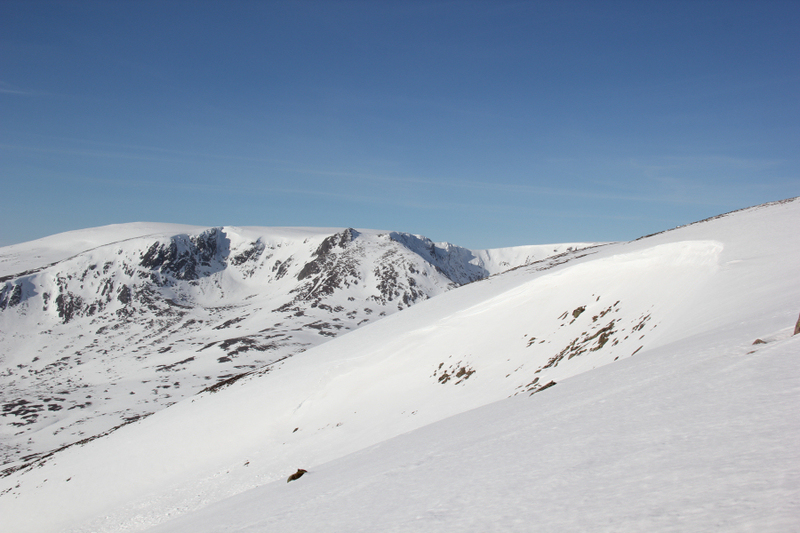 Once up high the snow was nice and hard as far as reaching Ben Avon. However due to the sun it was harder work on the way back as it was all melting. 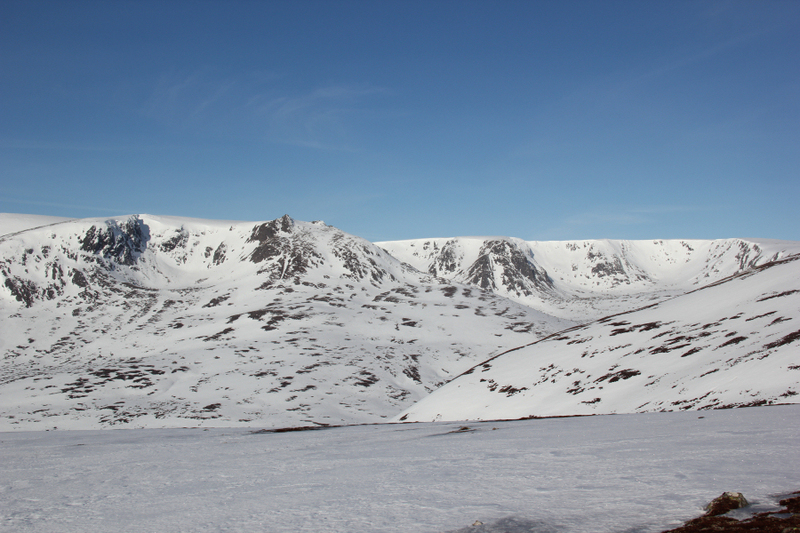 Given how much the snow was melting, I didn't fancy descending into the coire, so I had a quick look at the map and opted for descending off the shoulder of Carn Eas, which was good. Thanks Susie. 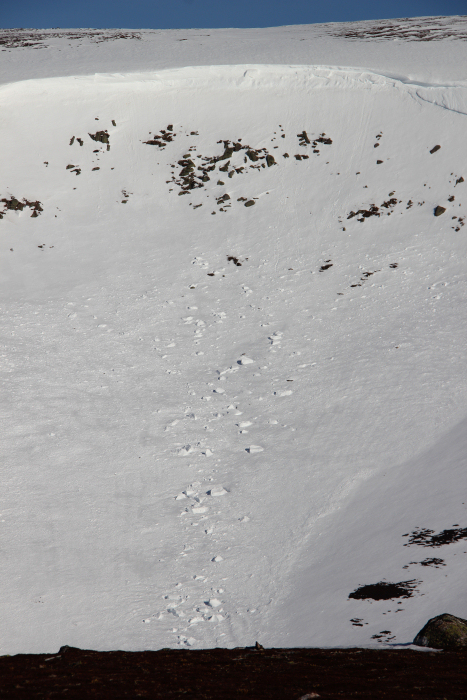 Lots of Ptarmigan up there just plodding along. Great birds.